Welcome to Howarth’s Garage’s new website! It was well and truly over due for a revamp, we’ll be keeping you up to date with our latest news and news from the motoring trade in this Blog section. 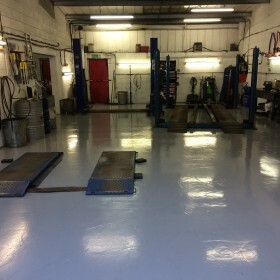 As you can see from the photo we’ve also given the workshop a revamp, nice shiny floors but we’ll also have to make sure we keep it clean too! Our reception area also had a makeover last year so we have a nice pleasant waiting area, we’ll even make you a cup of tea or coffee if your waiting while we attend to you vehicle.